The Western Australia Police Force is not liable to you or anyone else for any loss in connection with use of this website or a linked website. The information provided on the Western Australia Police Force website has been compiled for your convenience. While we strive for excellence, the Western Australia Police Force takes no responsibility for the accuracy or completeness of any information contained on this website. You must make your own assessment of information on this website and rely on it wholly at your own risk. The WA Police Force is not liable to you or anyone else if interference with or damage to your computer systems occurs in connection with use of this website or a linked website. The WA Police Force reserves the right to make changes, modifications, additions, deletions and corrections to the website, at any time and without notice. The WA Police Force is not liable to you or anyone else if errors occur in the information on this website or if that information is not up-to-date. To the extent permitted by applicable law, all representations, warranties and other terms are excluded. 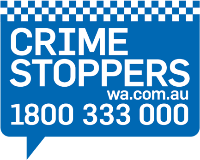 Western Australia Police Force has provided links to other websites for your convenience. These links may not be maintained or be current. WA Police Force accepts no responsibility for the content of those websites. The provision of a link to another website does not constitute an endorsement or approval by WA Police Force of that website, its owners or operators, or any information, products or services offered on that website. This website contains information, data, graphics, images, text and various forms of material prepared for and on behalf of the Western Australia Police Force. The content presented on this website is subject to copyright under the Copyright Act 1968 and is reserved to the Crown in the State of Western Australia. You are only provided access to it for your personal and non-commercial use. Other than for purposes of and subject to the conditions prescribed under the Copyright Act 1968 and similar statues that apply in your location, you may not, in any form or by any means, without the prior written permission of WA Police Force: adapt, reproduce, store, distribute, transmit, print, display, perform, modify, publish or create derivative works from any part of this website, or mislead or deceive any person, or commercialise any information, products or services obtained from any part of this website. Trade marks used in this website are the property of their respective owners. You are not permitted to use or link the State arms, seal or any other insignia and symbol of the WA Police Force, or any other Western Australia Government logo or trade mark without express prior written permission. The use of any 'police insignia' without consent is an offence and may lead to criminal prosecution. The term "this website" means the whole or any part of the web pages located at www.police.wa.gov.au (including the layout of this website; individual elements of the website design; underlying code elements of this website; or text, sounds, graphics, animated elements or any other content of this website). The terms "Western Australia Police Force" and "WA Police Force" stand for the Western Australia Police Force and includes the State of Western Australia, the Ministers of the State of Western Australia, the Commissioner of Police, members of the WA Police Force, all officers, servants and agents of the Crown and any authors or contributors to this website. The term "loss" means any loss or damage, personal injury or death, however caused (including through negligence), which may have been directly or indirectly suffered. The term "linked website" means a website or person other than the Western Australia Police Force, which are hyperlinked to or from this website.